Difference between revisions of "Wiseman Mncube"
'''Wiseman Mncube''' (born 1990) is a South African actor, playwright, and director is best known for his role as Skhalo on [[Generations: The Legacy|Generations]]. In 2016 he starred in the [[e.tv]] drama series [[The Kingdom - uKhakhayi]] as Mfanufikile alongside [[Melusi Yeni]], [[Noxee Maqashalala]], [[Sthembiso Khoza]], [[Tembela Mgandela]], [[Mncedisi Shabangu]] and [[Tumie Ngumla]]. He has had roles on [[Sokhulu & Partners]], [[Gold Diggers]], [[Ingozi]], [[Mamello]], and [[Ring of Lies]]. 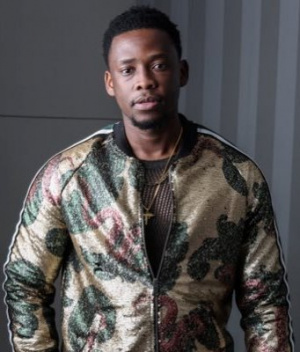 Mncube currently stars as Jama on [[Mzansi Magic]]'s drama series [[eHostela]] alongside [[L'vovo Derrango]], [[Sthandwa Gama]], [[Zola Nombona]], [[Bheki Sibiya]], [[Ernest Msibi]] and [[Pastor Mjosty]]. Wiseman Mncube (born 1990) is a South African actor, playwright, and director is best known for his role as Skhalo on Generations. In 2016 he starred in the e.tv drama series The Kingdom - uKhakhayi as Mfanufikile alongside Melusi Yeni, Noxee Maqashalala, Sthembiso Khoza, Tembela Mgandela, Mncedisi Shabangu and Tumie Ngumla. He has had roles on Sokhulu & Partners, Gold Diggers, Ingozi, Mamello, and Ring of Lies. Mncube currently stars as Jama on Mzansi Magic's drama series eHostela alongside L'vovo Derrango, Sthandwa Gama, Zola Nombona, Bheki Sibiya, Ernest Msibi and Pastor Mjosty.